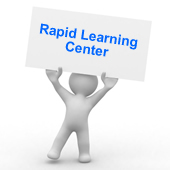 Rapid Learning Center is the leading provider of rapid e-learning solutions in chemistry, biology, physics, math, statistics and other core courses at high school, college levels and beyond. We also offer test prep rapid learning packages on MCAT, DAT, OAT, PCAT, Pre-Nursing, AP, SAT and other standard tests, with more to come. Our Rapid Learning Team is a team of talents including university professors, high school educators, learning specialists and instructional designers. Read about the rave reviews from our students, teachers and parents. Get insiders' study tips on our Rapid Learning Blog by our faculty. Diop M. El Moctar, Ph.D.